Mail4Rosey: Things are Looking UP (literally and figuratively). Things are Looking UP (literally and figuratively). I know some people don't care for the local fairs, but my kiddos and I love 'em. My teen likes to see the animals, ride the big rides (especially those that go very fast, or flip upside down), and eat elephant ears. He still likes (and fits in) the kiddie rides. My little guy likes to ride the kiddie rides. He even enjoys hopping on the merry-go-around. This pic. makes me laugh. He went on the slide over and over again. His first year being big enough to ride! 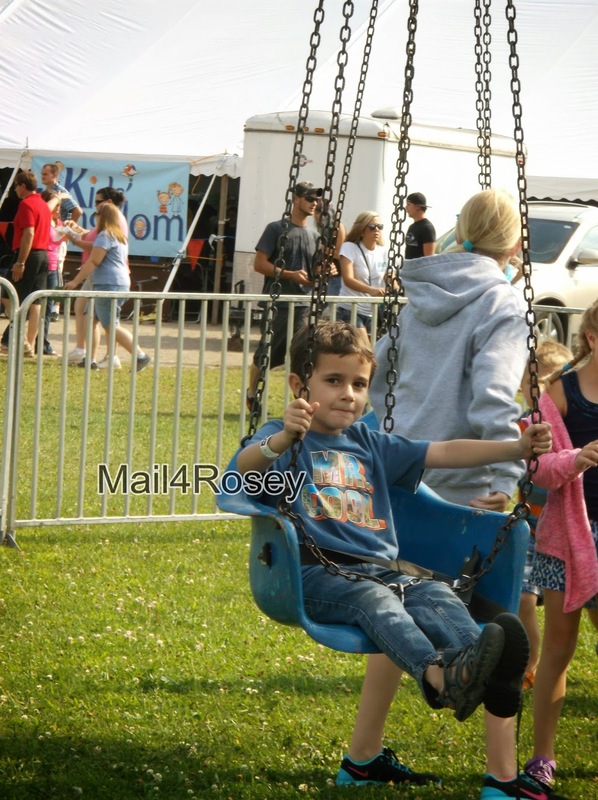 This year, the fair was a big deal for little man because he got to ride the swings. This was his first time and he loved it! First time on the Tilt-a-Whirl without mom. He was thrilled to be at the height minimum. I was happy that he got to experience some things that were new to him this year. We had a great time! I so loved to do this back when my son and then my grand-babies were young. They so loved it and we still talk about those times to this day. Great fun and tons of lifetime memories. My kids love those local fairs, too. I don't mind the rides necessarily, but I always feel like I go there and end up spending a small fortune between the tickets and the snacks. That does look fun! We haven't been to the fair in a couple of summers. Me too, i only like kiddie rides.. my wife and son love the bigger rides. I can't remember the last time a fair came to town here in Trinidad. We have circus' though, but that's not nearly as fun as a fair. Oh my goodness. 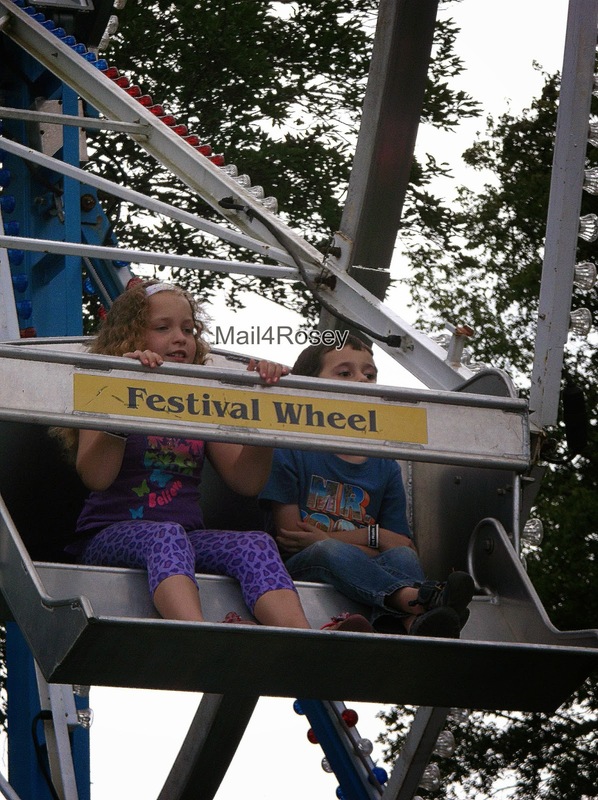 He looks so TINY in that Ferris Wheel seat. And is growing up fast. I know the day is coming that my son will be begging to ride the bigger rides. Can't I just keep him little a little bit longer? He looks so delighted, (and tiny) what a wonderful memory you've helped him create! It looks like so much fun!! Yah! What memories you must have enjoyed! The swing and the big slide use to be my favorite when I was a kid. It looks like he had a blast!! I love watching people there. The funnel cakes and terrible for you snacks are not to be missed! I love summer traditions,too. Making memories with your family is the best! I love going to fairs. I just discovered that my daughter loves carousels. I love the German swings! I bet your son had a blast, finally being able to ride some of the bigger rides. My kids were so excited when they could finally ride what they wanted. I love a good fair. 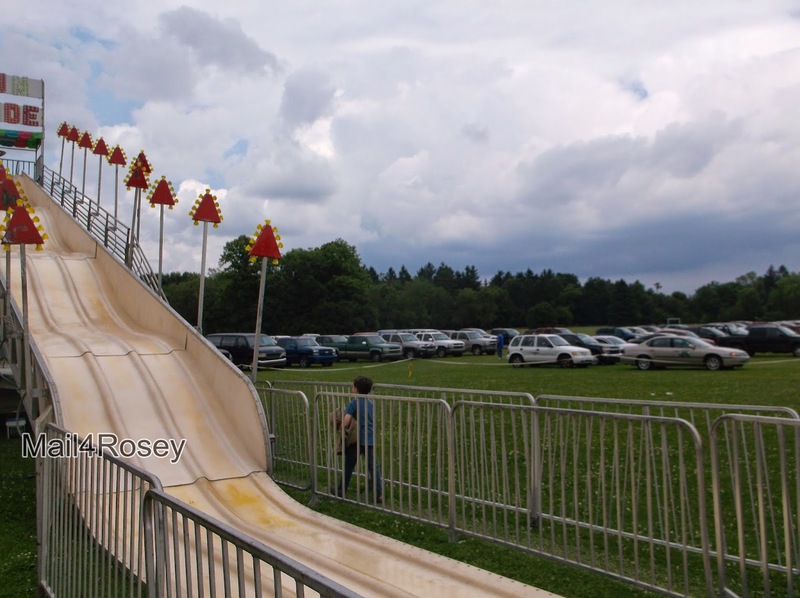 When I was a kid growing up in Alabama, we'd always go to the county fair. It was awesome. Now those are my kind of rides! I love the easy going ones! Yes, it keeps changing. I still remember waiting to meet the height requirements, now that is long past! 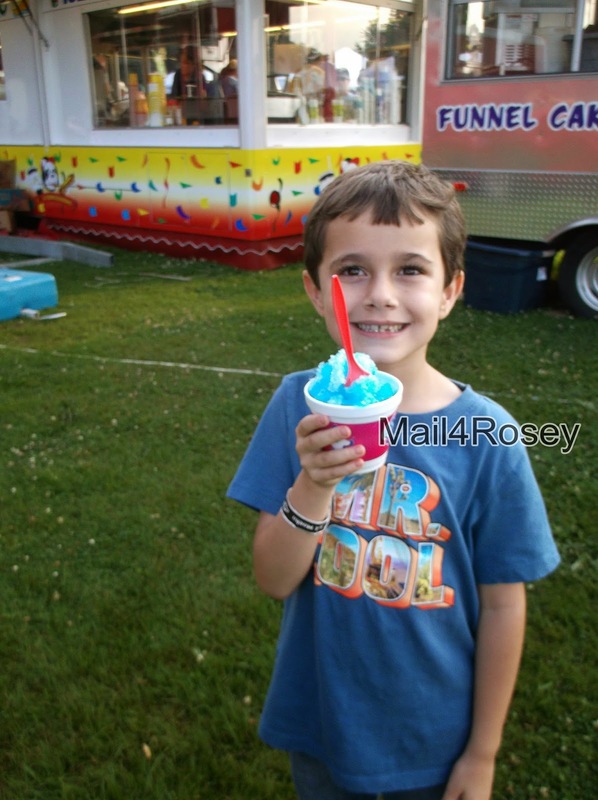 Small town fairs are so much fun and that sno cone looks yummy! The state fair will be starting up soon and I'd love to go. I'm too old for the carnival part...haha!...but the exhibits and shows are fun to see. Oh to be a kid again...just long enough to ride the carousel! So much fun! So sweet to make memories at small town fairs. I liked those burlap bag slides! Tall enough to be fun, but not too tall. We love local fairs - our county fair is in two weeks. This weekend we are heading to the Wisconsin State Fair! Fairs are so much fun! It's cute that he got to go on the big kid rides this time! I used to go on everything and now I have to take motion sickness pills beforehand, lol! I love going to fairs and Tilt-A-Whirl is one of my favorite rides! We love fairs and theme parks of all kinds. It seems like there's something here every couple of months. Aww, what a fun time! I love fairs like this! Those slides were always my favorite. Your son is so cute! I skipped the state fair this year, but my guys went one day. They had fun. Elliott loves those slides, too. :) They ended up meeting up with one of Elliott's friends (unplanned) that he hadn't seen all summer so they rode rides together for a while. It got Elliott on rides he probably would have skipped otherwise. He's not very adventurous at all. Glad little man had a great time and got to experience new things at the fair this year! Oh how fun. I really want to go to the county fair. Can't wait for ours! 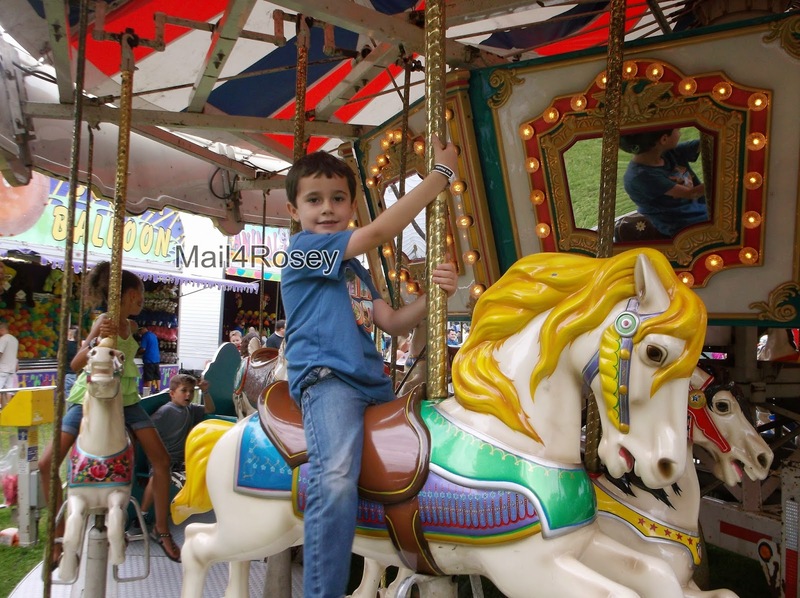 We love going to fairs,How lovely that you son was able to enjoy the rides he has been wanting to do for a while.It is always so nice seeing kids getting to enjoy their first times like this. Eat elephant ears? What is that? Is that like beaver tails? It's a big day when you're tall enough to ride the rides! Local fairs are way more fun than the big fairs where you have to drive for a long time, fight the crowds, and spend a fortune. I too am a lover of local fairs. It all seems so old fashioned. My only concern is the safety of the rides. I loved the fair as a kid. I, too, remember anxiously anticipating that day when I would be tall enough to ride the "good rides." That slide did look really fun. I wouldn't have minded that one even now. I guess I do have a little kid alive and well in here! I love the State Fair. There is so much to do and it is great fun for the whole family. I make it a must to have at least one elephant ear. lol Thanks for sharing. He's such a cute little guy. I'm glad he had fun at the fair and is still enjoying summer. Our kids are back at school on Monday. I LOVE going to my Local Fair. It comes every Sept and we count down the days. My boys love rides. Isaak's not tall enough for many of the rides though. That slide looks like such fun! I love fair food. Glad he got to enjoy some bigger rides. Often county fairs are just as good as the state fair. I love country fairs, they are my favorite!!! I love the food, the laughs, the exhibits, etc. That slide looks like fun, I'm too spooked to do anything more than that. They are good memories, too, from when you were little, and still fun now! When my son was a toddler he doesn't want to ride carousel and try the slides. But one day he tried the slides and he liked it. 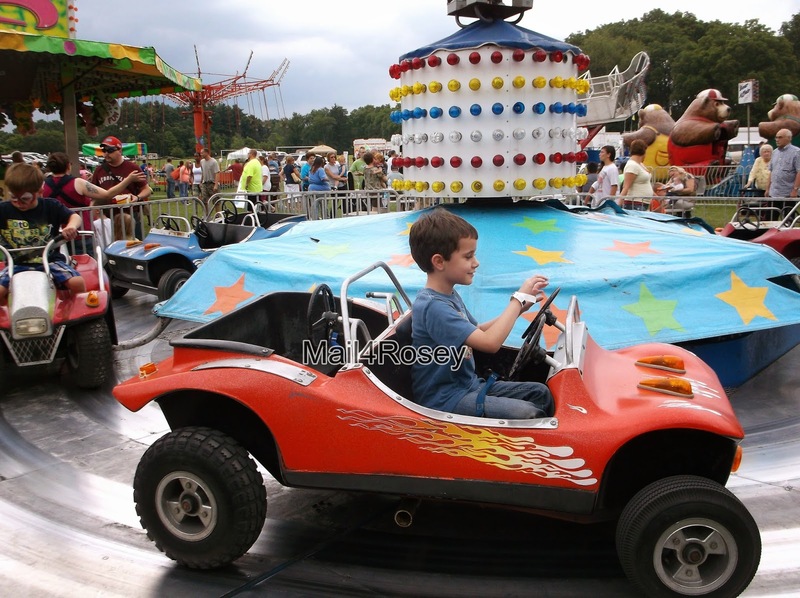 This looks like so much fun, we still haven't taken the kids to a fair, I know they would love it though.. maybe next year when the little ones are bigger.. I'm in Ontario, Canada, and I'm not sure where abouts you're located but this fair looks EXACTLY like our hometown one. Funny how there's not much different in the rides, or the look of them, from place to place and generation to generation. Can't beat a classic, I suppose! Glad to hear things are looking up for you. Fairs are so much fun! I always think little local fairs and festivals can be a lot of fun. We have quite a few that bring in local animals from farms so that at least we know their is no question about treatment. Ah!! This is great! We did Disneyland earlier this year and there was one ride that JJ couldn't go on that he really wanted to and it brought him to tears. The only thing that helps after that is cotton candy. I think we will have to hit our local carnival next summer. It is crazy how fast they grow up. Aww he looks like he had a great time. They just seem to grow too fast. My littlest is starting to notice brother and sister doing things she can't do. 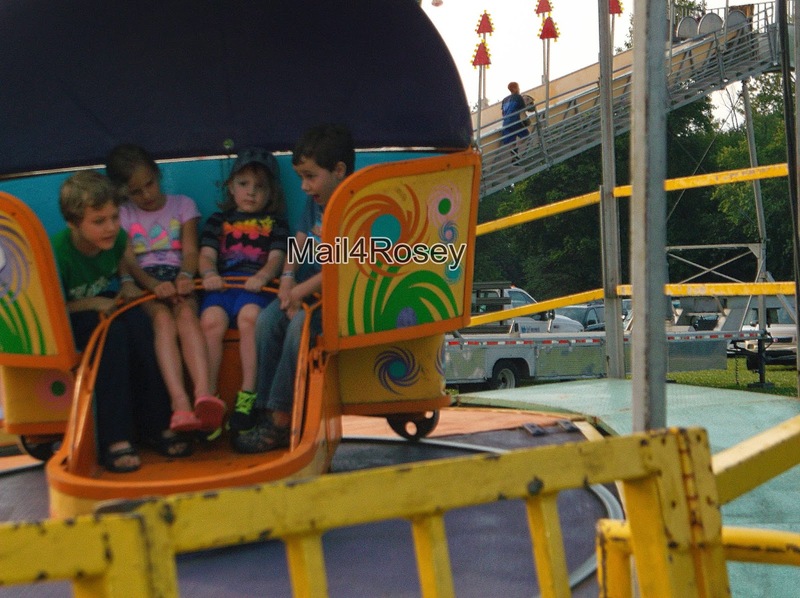 In my opinion there is nothing more exciting than seeing a county fair through a kids eyes. I love the fair! My daughter loves going to local fairs and doing all the rides. She loves playing the games, winning prizes and eating all the junk food. I remember being too small for the big-kid rides :( I'm still barely 5 feet tall lol. It was so sad when all my friends could go on rides that I couldn't and we were the same age. That looks like fun! My kids love those slides.. I'm slightly fearful of them. My kids would absolutely love this place. They love the slides and all those kid rides. OMG looks like you had a lot of fun. How much fun! I'm glad they had such an awesome time! Love the "peeping" one. Christopher would not get on a ride without me. He's not crazy about rides in general and it's been a couple years not since he tried one. Maybe this next year will be the year he discovers it's really fun. I wonder if fairs travel according to weather? It'll be nice here in October and that's when ours will be here. I guess your October will be too cold? I feel your and his pain. We get season passes every year to our local theme park, and my youngest boy has been just a bit too short for the last two years to ride the big roller coasters. He is always so disappointed. Looks like a fun place to visit. He's so much braver than my son! We're hoping to reach some height limits this year! How exciting for your kiddo! My kids are still way under the "you must be this tall to ride" line! Awww. How fun and exciting. Always cool to hit a milestone. I love local fairs how fun! It looks like your family had a great time in a beautiful place. There is something wonderful about giving your kids a great day to have fun and remember forever. This looks like such a fun place! My son would really enjoy a visit there. Oh my - he has grown up so fast hasn't he? Glad he was able to ride some more rides - I love fairs like that too. I have not yet been to a fair and I want to go! Look at all that fun to be had! Looks like you all had a great time! Love the pictures! We went to Disneyland a couple of years ago and my baby was JUST tall enough to get on almost all the rides. It was hilarious because she could fit under the measuring stick, but as soon as she stood to her full height, her head would just touch the bottom. IN! I also love summer. ahhh, fairs are the best, aren't they?! they always leave you feeling happy...almost giddy. i used to love them as a kid, but to see the fun through your child's eyes...it's incredible! i love what you said about it being so easy to make them happy! it's so true! that's so awesome your son got to try out some of the "older" rides!! and so awesome you got a band for all day! that's the way to do it! ps - i've been meaning to ask you if you have Instagram?